Place gelatin into bowl of a stand mixer along with 1/2 cup of water. In small saucepan, combine 1/2 cup water, sugar, corn syrup and salt. Cover and cook on medium high until mixture reaches 240° F (about 10-12 minutes). Remove from heat and pour into stand mixer bowl. Whip mixture on high for 15 minutes – should be lukewarm and thick. Add vanilla and optional flavorings during the last 2 minutes of whipping. Add red or green food coloring but do not mix completely. Instead, swirl color around marshmallows for a marbled effect. Invited to the neighbor’s annual holiday party and need a hostess gift idea? Say no to swapping bottles of wine this year! Get creative and try these elegant and easy hostess gifts for those last-minute soirees and family gatherings. Everyone loves the kitchen. It’s full of tasty morsels that are perfect for packaging up at the last minute. Here are some of our top picks. Simply bake a few batches of these holiday goodies, wrap in a simple cellophane bag or mason jar with festive ribbon, and head out the door with a cute hostess gift in tow. 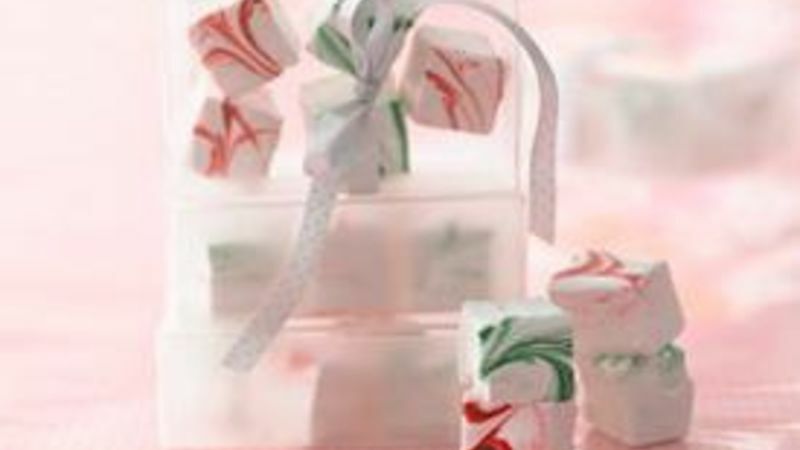 Try making your own candy cane marshmallows. Speaking of marshmallows, you can never go wrong with marshmallows and chocolate. Try this Rocky Road Fudge recipe to add as a new go-to holiday gift favorite. Whip up these candy cane snowballs for a delicious little treat. Easy to package in a variety of ways, your hostess will thank you for these festive bites! Go gourmet with white chocolate mint truffles. Easy to make (follow the step-by-step pictures); these will definitely be a hit. Headed to the house of a dog-lover? Sweeten the holidays for Rover, too, with this DIY Dog Bark! Whether you prefer eggnog, wassail, hot cocoa, or apple cider, the holidays are a time for sipping festive drinks with friends—and a homemade gift is a touching gesture to thank your hostess. Here are a few simple ways to add a personal touch to your present! Make your own hot cocoa mix by combining 6 cups instant nonfat dry milk, 1-1/2 cups granulated sugar, 1-1/4 cups cocoa powder, and miniature marshmallows (serves 12). Headed to a fancy holiday party? Combine sparkling wine with a small bottle of pomegranate or cranberry liquor for your hostess. Try a twist on the hot chocolate favorite by adding in a variety of “mix-ins” like mint baking chips, crushed peppermint, a gourmet mini bottle of vanilla extract, or chocolate dipped spoons perfect for stirring! Add the finishing touches to your hostess gifts with cute gift tags and labels. You can find a variety of free printable sweet treat + drink gift tags here!